In the past fifty years scientists have begun to discover how the human brain functions. 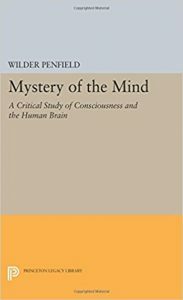 In this book Wilder Penfield, whose work has been at the forefront of such research, describes the current state of knowledge about the brain and asks to what extent recent findings explain the action of the mind. He offers the general reader a glimpse of exciting discoveries usually accessible to only a few scientists. He writes: “Throughout my own scientific career I, like other scientists, have struggled to prove that the brain accounts for the mind. But perhaps the time has come when we may profitably consider the evidence as it stands, and ask the question��Can the mind be explained by what is now known about the brain?” The central question, he points out, is whether man’s being is determined by his body alone or by mind and body as separate elements. Before suggesting an answer, he gives a fascinating account of his experience as a neurosurgeon and scientist observing the brain in conscious patients.Originally published in 1975.The Princeton Legacy Library uses the latest print-on-demand technology to again make available previously out-of-print books from the distinguished backlist of Princeton University Press. These editions preserve the original texts of these important books while presenting them in durable paperback and hardcover editions. The goal of the Princeton Legacy Library is to vastly increase access to the rich scholarly heritage found in the thousands of books published by Princeton University Press since its founding in 1905.